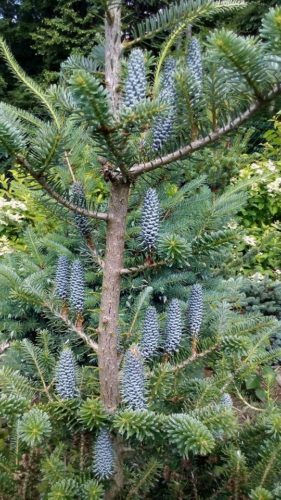 Abies koreana 'Vengels' is a dwarf, upright, tree-form of Korean fir with open branch structure and species-typical silvery Blue-green foliage. Its seed cones are a true horticultural curiosity. They purple-Blue in color and uniquely persistent among all firs with bristly texture, often producing new shoots through the tops. It is unknown whether they have ever produced viable seed. After 10 years of growth, a mature specimen will measure 4 to 5 feet (1.3 to 1.6 m) tall and 2 feet (60 cm) wide, an annual growth rate of 4 to 6 inches (10 - 15 cm). This cultivar is fairly easy to obtain in the specialty nursery trade. It is unfortunately of unknown origin. Abies koreana 'Vengels' in a private garden in Czech Republic. 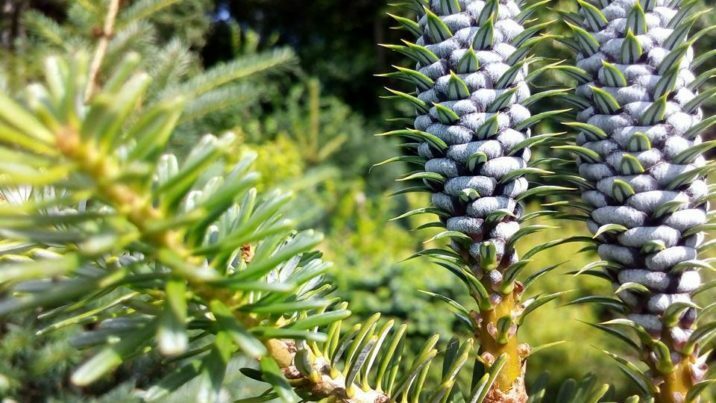 Abies koreana 'Vengels' — a closeup of foliage and "seed cone" detail.